1. Teeny Tiny Shopping Carts. If you are lucky enough to go to a store that has these, take advantage. At first glance it may seem like more work for you, but we promise it'll most likely make your tot more agreeable and happy to follow directions. 2. 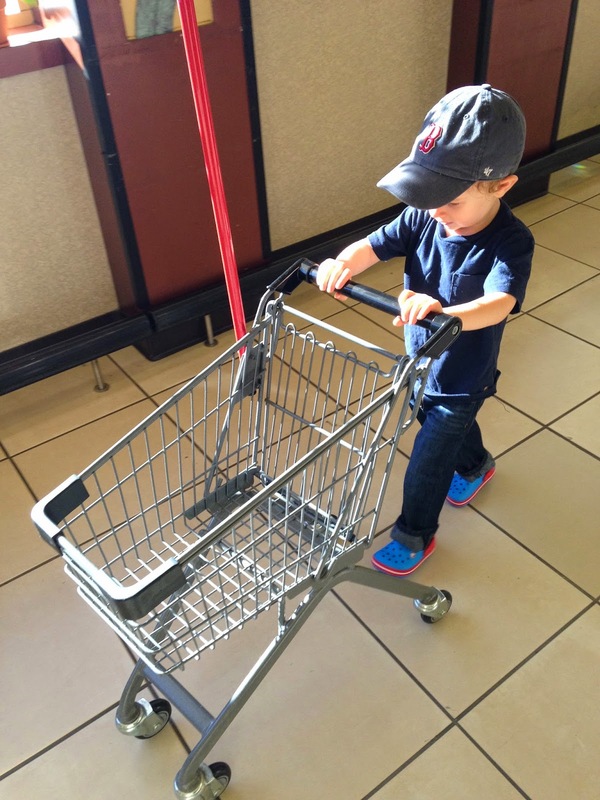 Have your little ones help you add ingredients to the cart. It will make them interested and willing to try new foods and it gives them a sense of pride. 3. Have them make and hold the list. If they are not old enough to read and write, have them draw pictures with your help. 4. Give kids the power of choice and ask them to help you create the week's menu. Ask if they want quinoa or brown rice. Roasted sweet potatoes or roasted cauliflower? This will make all the difference for them and how they see their meals. 5. Give them a healthy food choice that they may see as a treat when confronted with the crazy aisle of junk food. "We're not getting candy today but we can choose from this section over here." This is usually where the kid picks the $5 tiny bag of pistachios, but HEY it's better than a twix. One of the biggest ways to stop kids from picky eating is by not buying the other stuff. It's that simple. If it's not in the house they can't eat it. My Toddler Won't Stop Eating! 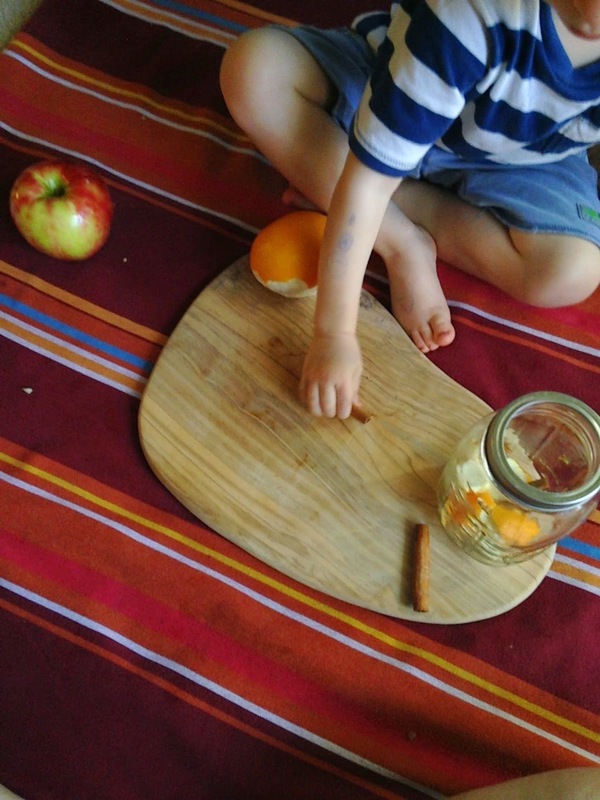 One of our recent posts talked about what to do when your toddler isn't eating, but what about the opposite problem? One of our followers pointed out that her toddler won't stop eating. Showing an interest in food is what us foodies are all about, but here are our tips for handling your cub turned hungry bear. Keep in mind, there are possible medical reasons for overeating so we recommend talking about your child's eating habits regularly with their pediatrician to be sure there aren't any medical issues that need your attention. Some mealtimes kids will hardly eat a bite and other times we don't know where they're putting it! It's normal for kids to be hungry and eat a ton of healthy nutrient dense food. They are growing and on the move! But if your little one is constantly eating and it's making you take pause, take an inventory of exactly what your child eats each day. We often get stuck in a rut giving in to processed kid snacks. Those snacks make kids hungrier faster, even the ones that claim to be healthy. The refined grains and sugars make them feel temporarily full, but before you know it they're hungry again. Try increasing their protein intake and avoid processed foods high in refined carbohydrates and replace them with natural carbohydrates high in fiber. Something like oatmeal* for breakfast instead of cereal will last longer throughout the morning. Skip the crackers, fruit snacks, or fruit filled yogurt (loaded with added sugar) in between meals. Instead, serve something more like fresh fruit with peanut butter, veggies with yogurt dip, or vegan cheese. They'll provide more nutrition and keep hunger at bay. Stick to a schedule - three square meals a day and two snacks in between is a reasonable schedule. Whatever your schedule, stick to it. Hungry tummies will adjust to mealtimes accordingly and it is okay to be hungry for a few minutes before meals. If they really need that extra snack (we all have those days) have them go to the table or some other spot where they are focused on eating, as opposed to watching TV or playing with toys. Allow them to eat as much healthy food as they want during each mealtime and don't rush them along. Some kids really take their time at the table, rushing them may mean that they leave the meal unsatisfied. Setting the rule that food is only eaten at the table will ensure that kids really are hungry and not just compulsively eating. If they're truly feeling hungry, they will focus on eating. If your kiddo is going through a growth spurt and does need more food, making sure it is eaten at the table and healthy will keep their energy up and blood sugar steady. Serving unhealthy snacks before bedtime or using food as a reward sends the wrong message, try using other types of rewards that your kid likes (for example, stickers or extra activities with you). Sometimes eating is something to stop boredom and some people are born nibblers- they just like chewing. But maybe they aren't actually that hungry- snacks like homemade popsicles or fruit leathers would be great in these cases. Activities that keep them busy could work too, like blowing bubbles, playing the kazoo, etc. 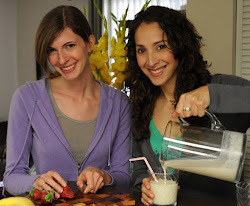 Serving healthy foods and keeping to a mealtime schedule can help prevent power struggles. If a kid's food intake is restricted too much, they may start to feel the need to obsess over food. If so, keep mealtimes structured but let them decide how much they need to eat. They may eat more at first, but eventually they will trust that the food will be there when they are hungry and will learn to listen to their bodies to tell them when they are full. If you feel like this is a bigger problem, talk to your pediatrician. *We recommend fixing oatmeal from scratch instead of using the prepackaged kinds. 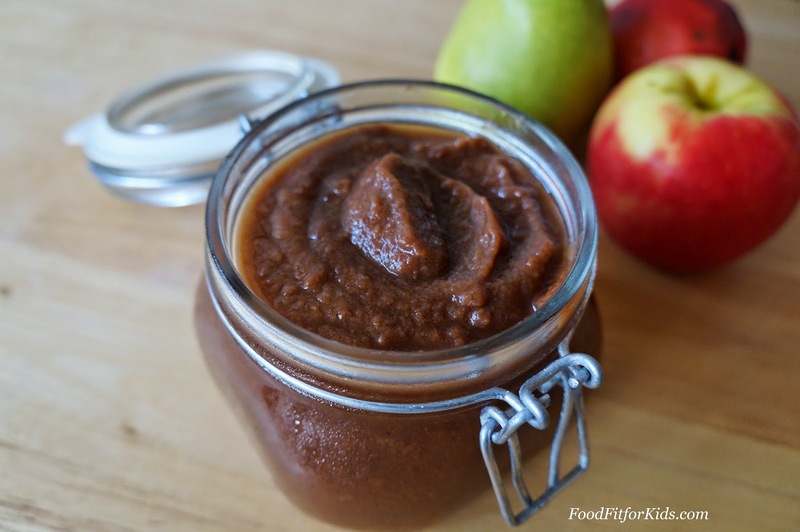 You can still make it quickly in the microwave but this way you control the sugar content, try using maple syrup! Overnight oats are a great option as well. So your toddler used to eat pretty much everything and has suddenly become that picky kid you dreaded. Even though you probably already know- this is completely NORMAL. It's a phase that goes away if you avoid creating more bad habits along the way. Yep, this is a common one. 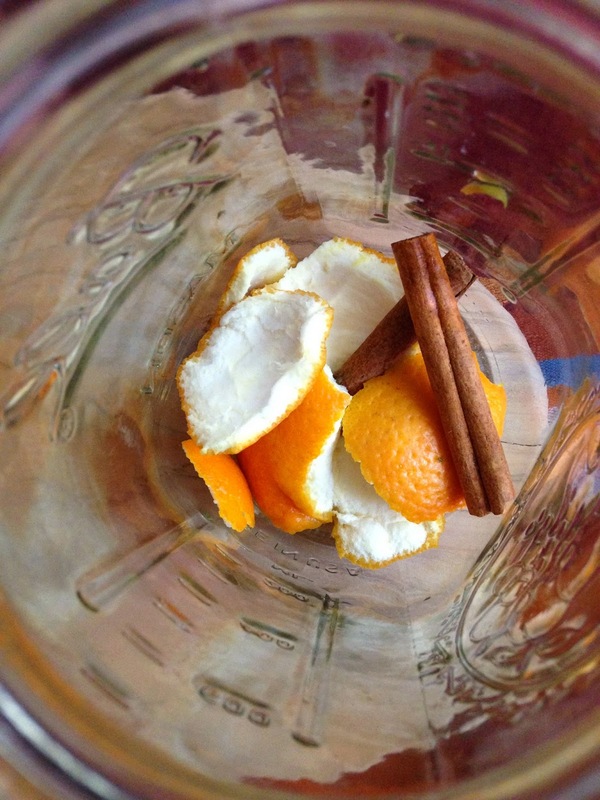 Sudden loss in appetite can often be the early warning signs to a cold or flu. Check for other symptoms like exhaustion (and irritability). The two D's! Your kid is learning something new everyday. They are suddenly seeing the world differently. 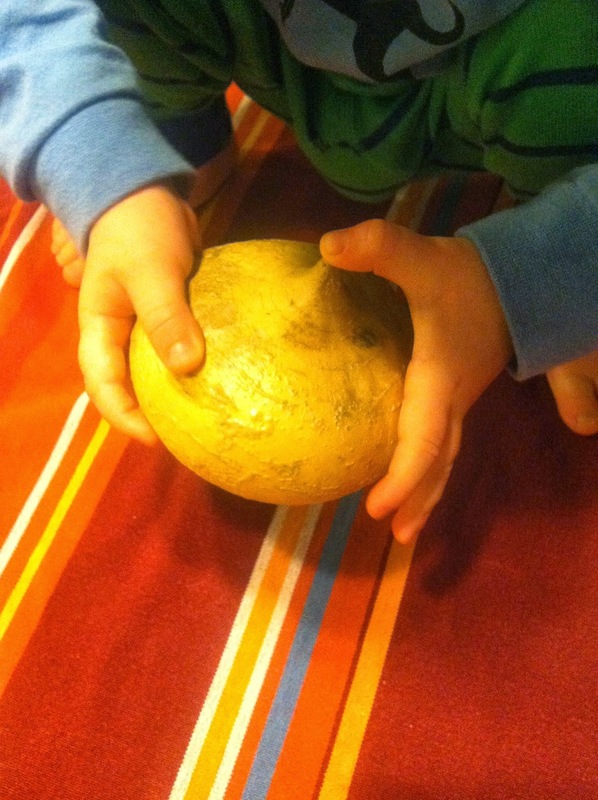 Able to reach light switches and doorknobs, discovering body parts and bodily functions. Yes, oh yes, they've got stuff to do and food to them is boring in comparison. Resist the temptation to short order cook, i.e. don't make them mac and cheese while the rest of your family eats tofu with rice. Keep meals low pressure- when they're hungry, they'll eat. 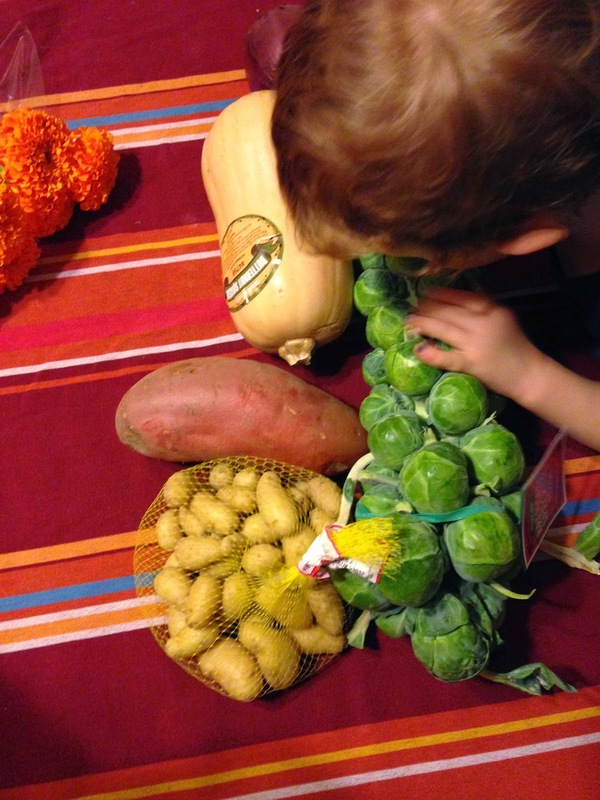 These tiny intelligent tots are realizing that mealtimes can be a total power play. They may be vying for your attention at this time, and find that they get more of it if they act up or refuse food. The best thing you can do in this situation is to be present and engaging with your child during this time. Give tons of positive praise. "Hey look at you eating with your fork!" "You tried something new!" Even include them in the prepping of the meal. Have them help cook, stir, rinse, set the table. 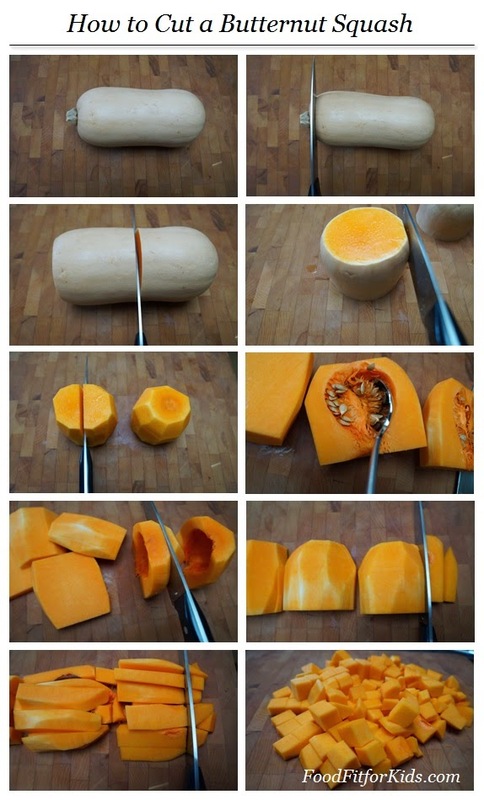 This may feel challenging but it will make them much more interested in eating and give you both bonding time. This often happens during the summer or holidays. Life gets busy and before we know it consistent dinner times have become erratic, the TV gets left on or we are regularly eating over at a friend's house. Before you know it, you realize that you aren't setting your toddler up for success. And sometimes it's completely unavoidable. When you know that the house will be full of out of town family members or that you are traveling, try to keep the rest of their schedule as consistent as possible. Often when bath and bedtimes are consistent so is appetite. If it's the holidays take a good look at what your child is eating, may be that they are getting lots of special treats from relatives and friends and have no appetite for nutrient dense foods. This is a common problem for most people. Observe how many snacks your child is given a day and how close to mealtimes they are given. This could be the direct cause of lack of appetite during meals. If the snacks are processed, refined or sugar filled, toddlers will get a taste for (aka addicted to) high fat/sugar/salt foods and snub their noses at fresh healthy ones. Fruit, nuts and vegan cheese make great on the go snacks that fill bellies and keep energy levels up. We've all done it. Made a separate meal for our kids because they might not like what we adults are having, or because we're ordering take out after they hit the hay. Maybe it's gotten out of hand and you've suddenly noticed yourself making 'toddler' meals for you littles every night. Before you know it they're exclusively eating mac and cheese and pb&j. Or maybe you've always cooked a separate meal because you tried introducing your little ones to food and it hasn't gone well. A couple nights of short order cooking can quickly turn any toddler into a demanding customer. They know that they can have something other than what's offered and will bat their eye lashes or refuse a meal to get what they want. Luckily kids are extremely adaptable. Have them help you cook the family meal, include them in the prep work. Kids are more willing to eat food they've had a hand in making. Kids are more likely to try food they've had a hand in making. Smelling and touching are precursors to tasting, so encourage them to help! Cooking together doesn't have to be complicated, simple tasks like mixing, rinsing or pouring can get little ones involved and excited about new ingredients. 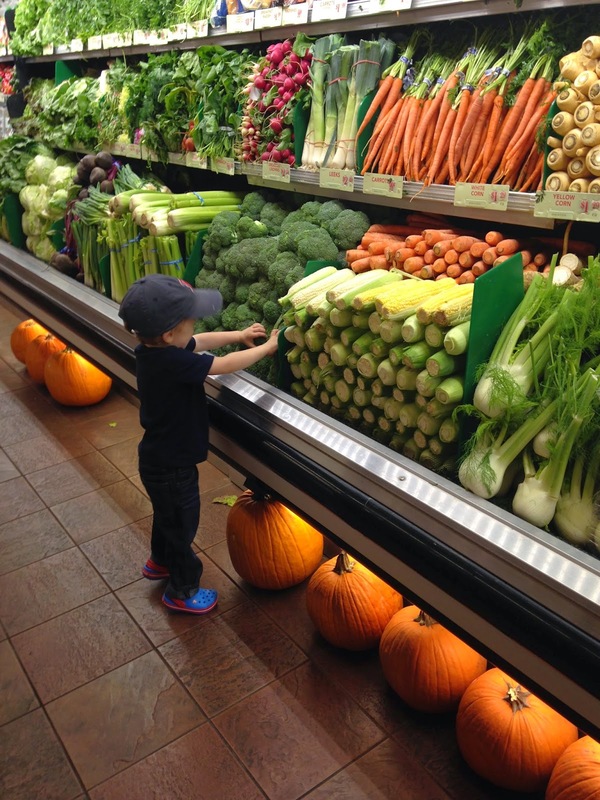 All the bright displays of produce (and free samples) will evoke your toddler's natural sense of curiosity. Encourage touching and smelling! 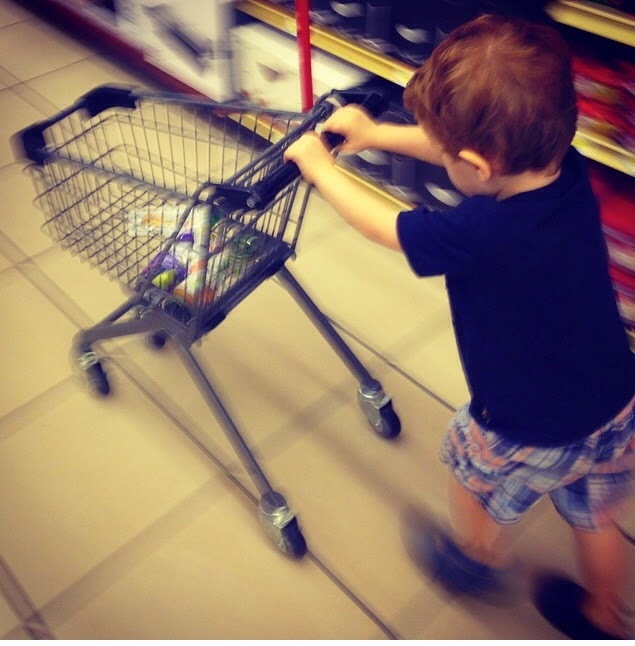 Involving your toddler in ingredient choices gives them a sense of control. Kids love to make choices and buy things. Regular exposure to new foods will get your toddler's palate accustomed to new flavors and textures. Don't worry if they aren't wolfing it down - the point here is for them to get used to unfamiliar ingredients on the table. A small taste is enough. 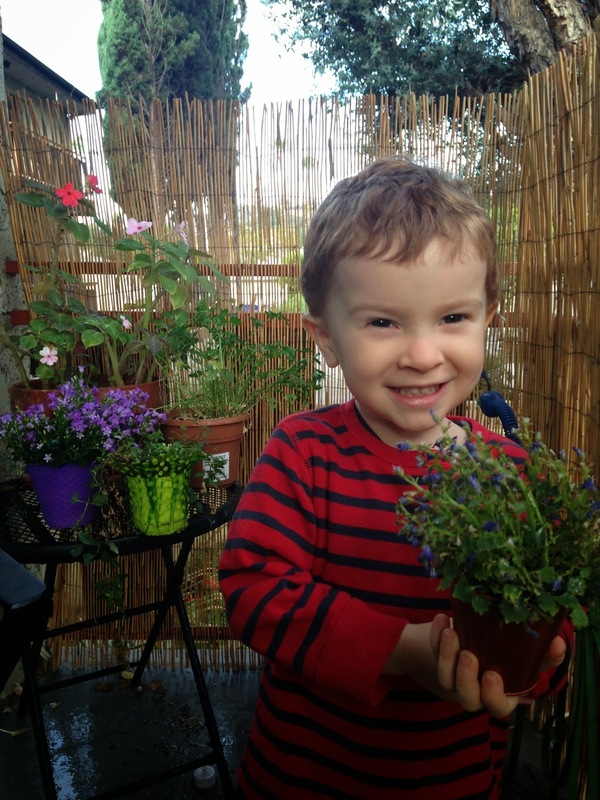 Let your toddler explore and marvel at how beautiful and amazing mother nature can be. Picking fruit and veggies usually leads to tasting, they can't help themselves! Kids are naturally curious. We recently embarked on a mission to find the mysterious and unique root vegetable known as jicama. 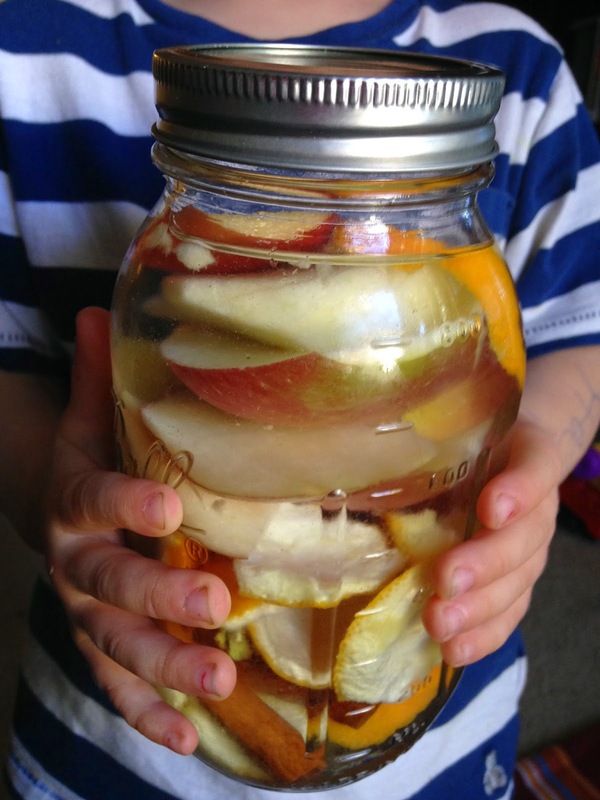 Our adventure led to many insights including, how to get a kid excited about trying a new vegetable, the wonders of all that is jicama, and a killer fruit salad that you will be making all summer- we promise! 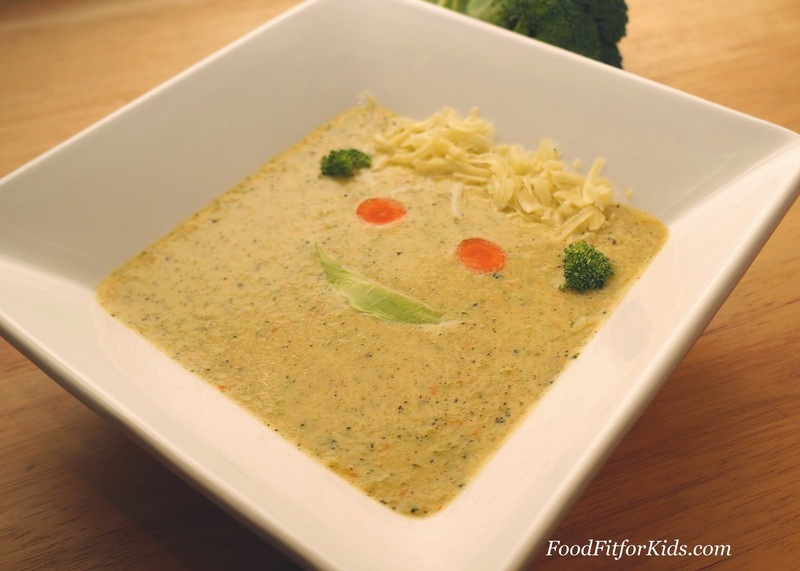 First let's start with getting your kids enthusiastic about trying new foods. For some of us this feels daunting! There are many ways to encourage your kids to be more adventurous but today we'll just mention one. Books! We've talked about it before, books are such an fun way to get kids excited. In fact this jicama adventure we recently went on was inspired purely by this book. 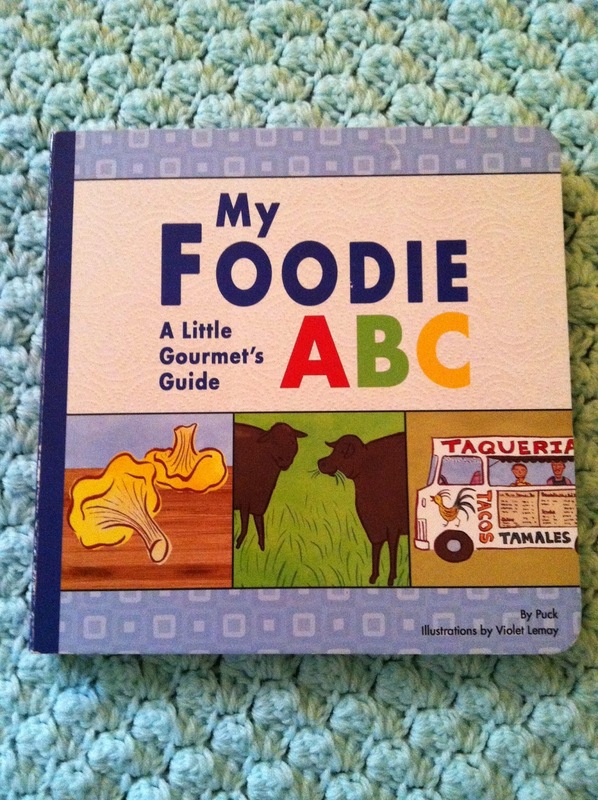 In My Foodie ABC, Little Gourmet's Guide by Puck illustrations by Violet Lemay, there is a fun new food or foodie term for each letter along with a description and adorable pictures. 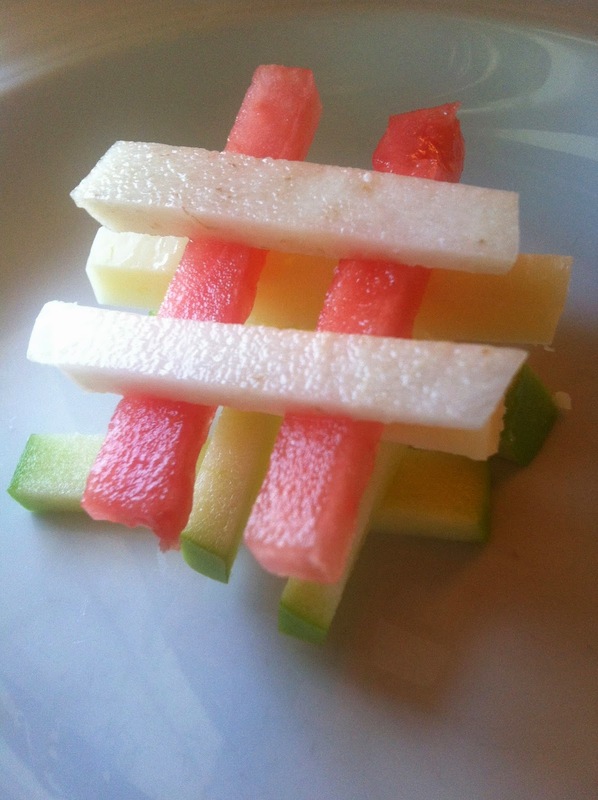 'J' is for jicama, by the way. 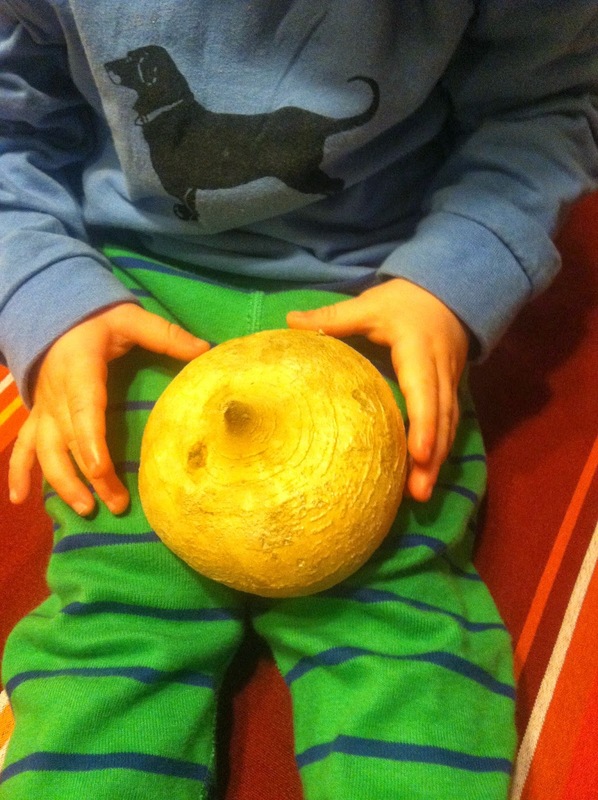 Our little kitchen helper (2 1/2 years old) was waiting to find a jicama for weeks and weeks. When we found some at our local farm, he was so excited! Jicama in its natural state. Curiosity sets in for this tiny tot. 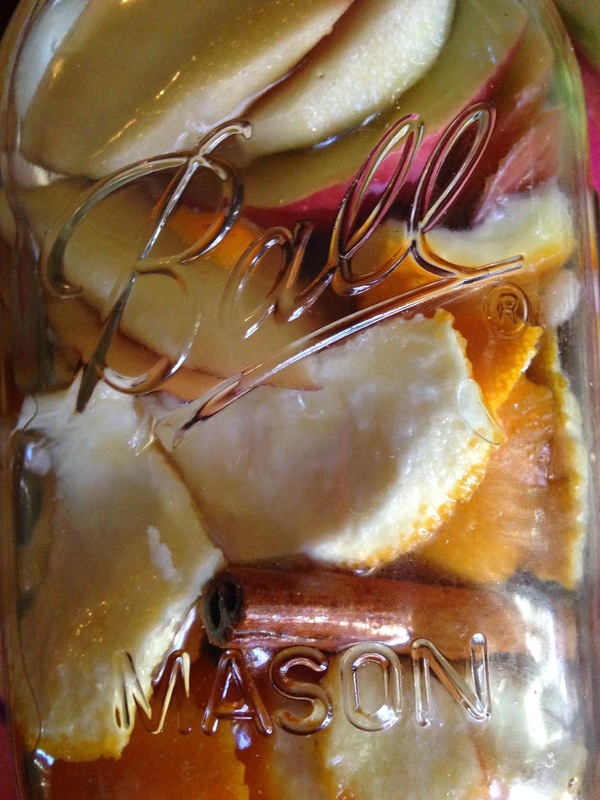 Best way to 'peel' is with a knife as the skin is too tough for a peeler. Salad ready to go! 'Jenga' anyone? Jicama is a unique root vegetable that's eaten raw, so we created a delicious salad around it. 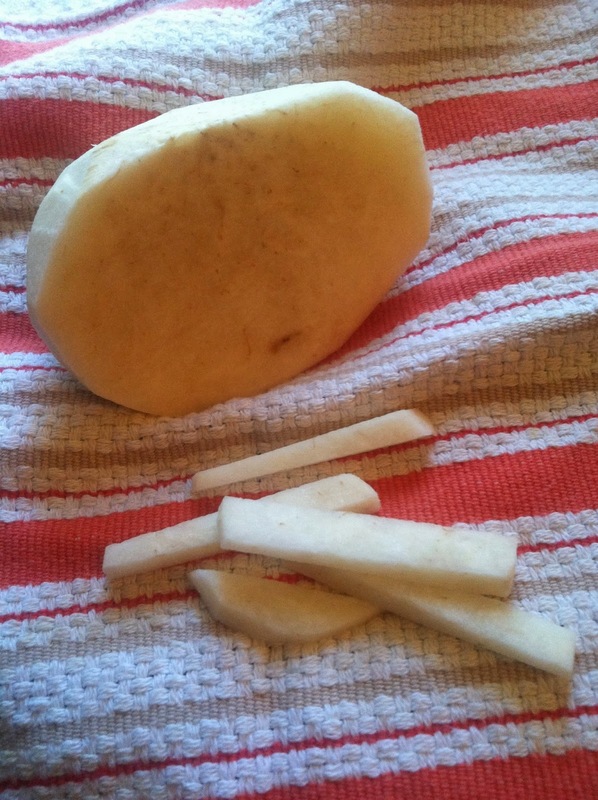 But let's face it, jicama is hard to find. So we recommend making this salad without the jicama if you can't find it. Trust us, it'll be something you keep making again and again. Simple real ingredients to keep your family healthy. 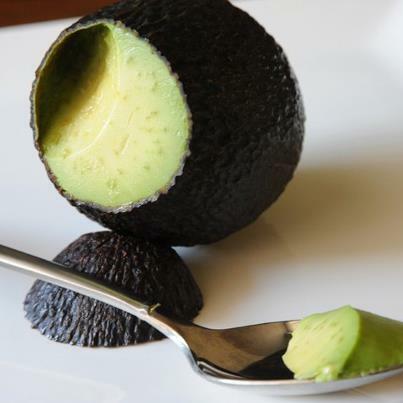 Cut and prepare equal parts of all ingredients in the same shape, mix with lemon or lime juice and enjoy!